Since my first visit of the year earlier in April, I promised myself a return trip to The Palouse to capture more of the spring greens. This Memorial Day, I fulfilled that promise. Cindy, my friends, and I drove down first to Palouse Falls and then to Steptoe Butte. It was nice to take a break from the constant rain we’ve been having for the past week. 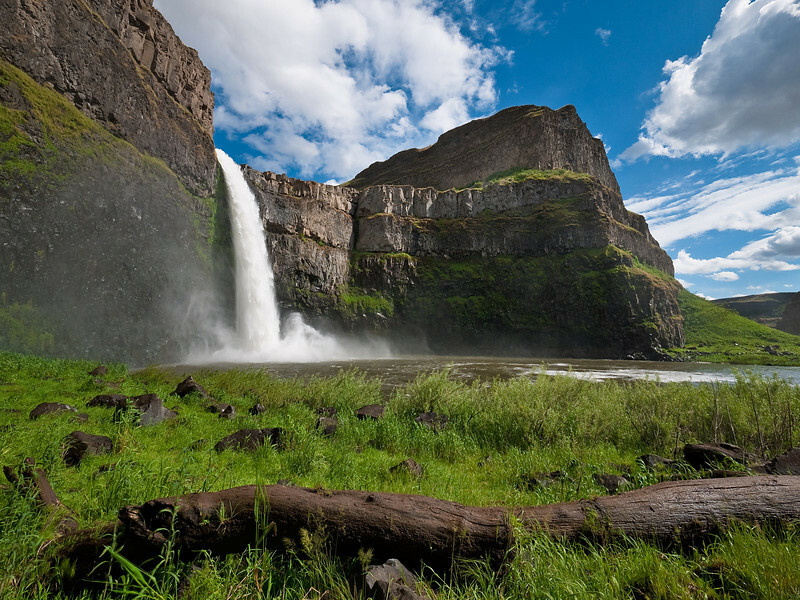 While at the waterfall, we hiked down to its base, and I was able to capture a not-too-often photographed view. The image was take at mid-day, but I really liked the wide-angle perspective and the white puffy clouds in that sea of blue sky. I hope you agree. 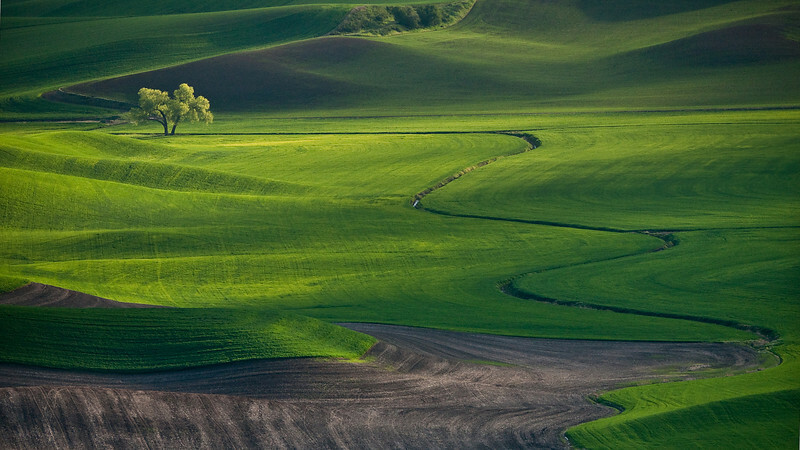 We were also blessed with good light at The Palouse. The recent rain had minimized the atmospheric haze and the brilliant spring greens were breathtaking to behold. I tried to stray away from the “typical” shots and concentrated on creating some unique compositions. As the sun went down, the overhead clouds turned a nice shade of pink just before a downpour rushed towards us. All in all, this was a fine day! I love this one. When I first looked at it I thought I was looking at the ocean… Something about the way the sky looks with the rolling hills… Beautiful. Goldie, thanks for the comment. Long time no see. I really like that image too. That color in the sky lasted for about 30 second, then it was gone. beautiful, we loved them all but the silo really grabbed me. what side of Steptoe was that taken? Also, I love the falls perspective, where is the trail down? when we were there last October we couldn’t find a trail down. Ann, thank for the comments. 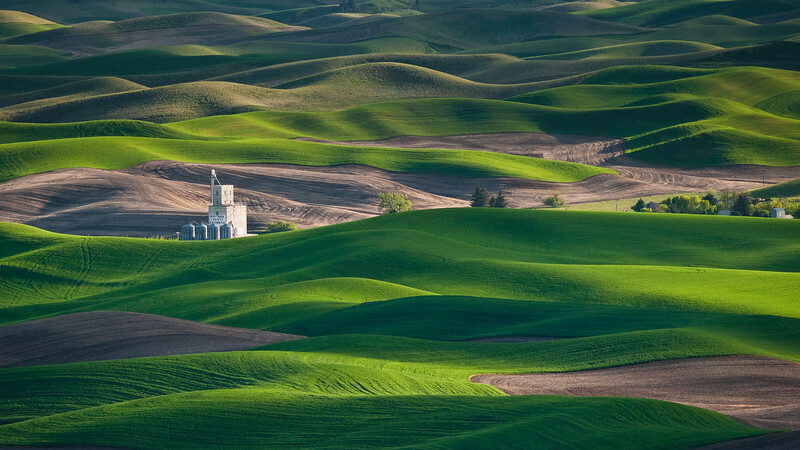 The silo shot was taken from the northwest side of Steptoe Butte, about 3/4 way up to the top. As far as the fall, there is a trail leading down from the South end of the state park, by the railroad tracks. On the day we were there, a local volunteer told us about the trail head. The path is a little tricky at a few places, but nothing you can’t handle with a little care. Also, there is poison ivy along the way, so be careful. Hows the new Subaru buddy? Ant (oops, I mean Mr. Anonymous), thanks for the comment. It was our pleasure to show you around our beautiful state, even though the weather was less than ideal. Come back in the summer for the wildflowers of Rainier and the Olympic beaches. The Subaru is running great, BTW! Khun, thanks for the comment! I didn’t understand a word of it until I visited the site you listed and entered your comment into Google Translate. I appreciate the sentiment. Danke!